POLA records busiest July in its history, moving 833,568 TEUs. This year’s peak shipping season is front-loaded, thanks to the tariff wars. Importers want to get products stateside before the tariffs hit or before further tariffs are imposed. The Port of Los Angeles could lose a quarter of its cargo if the US-China trade war persists, according to the port’s executive director Gene Seroka. Meanwhile, the port processed 833,568 TEUs last month, the busiest July in the port’s 111-year history, exceeding July 2017, the previous record, by 4.6 percent. It was the fourth busiest month overall in the port’s history. “With a robust economy and cargo owners moving goods ahead of expected tariffs, our terminal operators, labor force and supply chain partners seamlessly moved a record amount of cargo across our docks,” said Seroka. 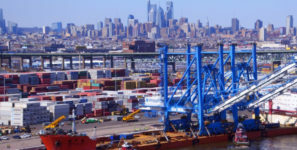 Seaports around the country are seeing a front-loading of this year’s peak shipping season, and experts say much of this is attributable to the tariff wars. The calculation is to get products stateside before the tariffs hit or before further tariffs are imposed. A first round of US tariffs directed specifically against China—ostensibly for intellectual-property abuses—started in July when President Donald Trump hit $30 billion of Chinese imports with a 25-percent levy and China responded in kind. Another $16 billion became subject to US tariffs on August 23, and China announced a modest increase to its import-tariff program. The US Trade Representative is currently considering imposing tariffs on an additional $200 billion in Chinese imports, levies which could go into effect as early as September. LA imports in July increased five percent to 438,165 TEUs compared to 2017. Exports increased 8.4 percent to 167,992 TEUs while empty containers increased 1.2 percent to 227,412 TEUs. Seven months into 2018, overall volumes decreased 2.6 percent compared to 2017, when the port set an all-time cargo record.